theLearnia is a virtual whiteboard that allows you to record video lessons using your voice while interacting with the whiteboard (write, draw, insert images). It even allows you to import your PPT presentation and convert it to a video lesson. theLearnia is free and. above all very simple to use. Here is how theLearnia works: In the planning stage, you can add a wide variety of content to the whiteboard including text, images, lines, shapes etc. You can also arrange your content into multiple pages or simply import your PowerPoint presentations. Next, now that your slides are ready you can start your recording. Whatever you sketch or draw on the canvas will be recorded as an animation. When you are done, watch a preview of you work and if it does not require any further editing you can proceed with sharing it with others via email or through social media websites. 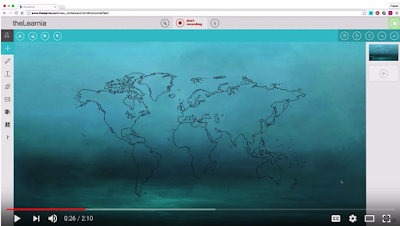 Watch the video below to learn more about how to create a video lesson using theLearnia.